For the longest time, my favorite was Empire; unfortunately, Empire apples have a short season, and have disappeared from the grocery stores in the summer, and I haven't seen them back in bounty just yet. 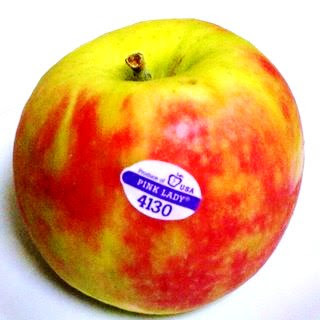 Last week, I decided to pick up a new type of apple: Pink Lady. AND I LOVE IT! The apple is crisp, sweet, juicy, and has a pretty color: what's not to like? I like storing my apples in the refrigerator, because I like them cold. I think this would be a great apple to use in cooking, but it is absolutely perfect for eating as is. 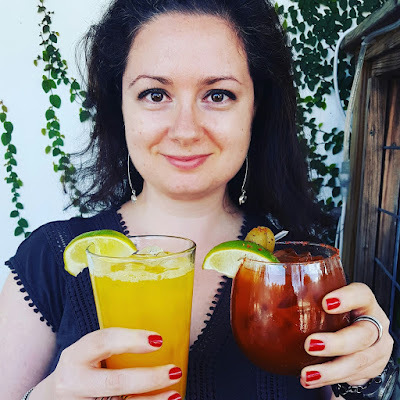 Last week I wrote a mini reference article for Cookthink about which apples are best for cooking (once the reference is published, I'll let you know). It was fascinating to learn about the different varieties of apples, and I especially found this website very helpful: All About Apples. Hmm...maybe I should plan an apple picking adventure??? The pink lady is my favorite type of apple. Hope you enjoyed it! oh, that is one pretty apple! i'm a fuji or honeycrisp person myself, but pink ladies are good, too! Pink Lady is popular here in France - great apple, but what i really love is the name! Thank you for posting about the pink lady apples! I bought one by accident a month ago at a grocery store in San Francisco (I think it traveled over from another bin) and it was so delicious but I didn't know the name of it! Do you know where they're grown? I love the pink color inside! Emma: you are quite welcome :) Actually my apple wasn't pink inside: go figure! I love walking out to my Honey Crisp apple tree in my back yard and picking a basket full of my favorite apples. I did pink lady and honey crisp, but Fuji have got to be my all time fav. I just bought a whole bunch of different kinds of apples. I'm going to experiment and bake them and see which kind turn out best. As for the taste, I like Honey Crisp apples! i went apple picking the other year and they had pink ladies. Ask Cara for the name of the place it was soo much fun! my favorite apple is a fuji or red delicious....tough choice. I just started eating apples because I found pink ladies. They are the only one for me. Try the Honeycrisp apples that have been around this past season.. they are SOOOO good! pink lady apples are generally my favorite too, so since you like those you will love the honeycrisp!